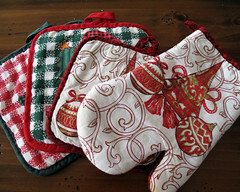 Lets face it, how much does one really need oven mitts to match the season or tea-towels or aprons or door mats for that matter. All these things are purely designed for wasting peoples money. I know you are probably thinking “Bah Humbug” but really, isn’t Christmas supposed to be a religious holiday to celebrate the birth of Jesus not a retail sell fest to empty our pockets. I just hope someone gave me these oven mitts and that I didn’t waste money on them myself, either way they are doing into the donation box. But they’re so pretty! (LOL, that’s how i get into messes) Just wanted to let you know that i found your blog about a week ago when i was googling decluttering, organizing, hoarding and the like. It’s been quite helpful so far, yesterday dropped off 2 large trashbags of clothes that were haunting my closet, and 2 medium size boxes of gift clutter and excess glassware. Next week i plan to go through the too-large collection of towels (animal shelter loves getting those) and perhaps kitchen linens as well…. “But they’re so pretty!” Hey at least you know your weak spot now all you have to do is hone your skills at overriding that weakness because that is what clutter is all about really, weakness. So welcome to 365 Less Things Susan, because we are all about helping you recognise your weaknesses and to resist temptation. No only the temptation to acquire stuff but the temptation to keep the stuff you already have. We are all about letting go. So you have come to the right place. And from what you say here you are already on the right track. So keep up the good work and continue to let us know how you are getting on. We’re always here ready for a chat. I think some of these things are personality-type driven. There are certain personalities that go totally gaga over holidays (St. Patrick’s Day! Valentines!) and especially the elaborate trappings thereof. I think most people fall in between these two extremes (thankfully), so we each have to decide for ourselves (and with any significant others) what is actually providing quality of life for us personally. I could get by without a lot of holiday “stuff,” myself, but I definitely see the sense in storing a special tote or two of Christmas stuff in the attic so that I can decorate once a year with cool, “special” stuff. I think the key is to store it all together (no hunting for stuff or losing stuff or things being stored in the hall closet for 11 months) and anything that didn’t truly add to your holiday season gets ruthlessly tossed before you repack. If it stops feeling worth the effort of setting it all out ’round Thanksgiving or so, it’s definitely time for reaming! you are right Christmas is something different for everyone. We all have our own way of celebrating it some way over the top while others not so much and then there are those that don’t celebrate it at all. Each to his own I say. 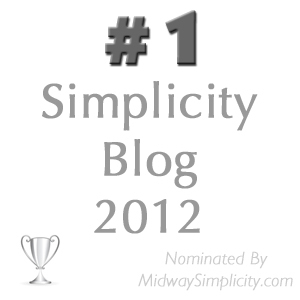 But for me I now prefer to keep it simple. When my family first moved to America and had our first winter Christmas we went nuts with the novelty of it all. It didn’t take long before the novelty wore off and reality set in again. We did enjoy it though and just the thought that it might snow added that extra element of excitement. We have now settle back into our own way of celebrating which is fairly minimal and it is a mutual agreement between us. That is my husband and two children. My Christmas decorations now fit onto two boxes, one for the little ornaments and one that holds the nativity scene. There used to be a big box with the tree in, a wreath box, two large boxes full of other decorations and the nativity scene. I am much happier with just having the special pieces that I really enjoy. By the way Allison, I would like to extend to you a very warm welcome to 365 Less Things. I hope that you will find whatever inspiration you need here to reduce you belonging to a level that is right for you. Have a great day and happy decluttering.